healthy vitals ProAssurance has been monitoring risk and protecting healthcare industry professionals for more than 40 years, with key specialists on duty to diagnose complex risk exposures. Work with a team that understands the importance of delivering flexible healthcare professional liability solutions. total hip replacement, mini-incision hip replacement, realignment procedures (avoiding joint replacement), and revision hip and knee replacements (when the prosthesis has failed). control pain, but it is no better or worse than steroid injections,” Smith said. “I’m not doing it because it hasn’t been proven to show a benefit overall. Stem cell transplants are very expensive and a lot of insurance companies don’t cover them. In addition to not being proven, it is a high out-of-pocket expense. It is still being researched. It might depend on how much cartilage damage there is. People who have arthritis to the point of needing knee replacement probably would not benefit from this procedure.” It is common for people to delay a hip or knee replacement because of fear of surgery or the recovery time involved. Smith said patients need to decide about replacement based on how much pain they are in and how much relief they are getting with conservative treatment. “If they aren’t getting relief and it is affecting their quality of life, then it is probably time to do something more,” Smith said. Born and raised in Hot Springs, Smith attended Lakeside K-12 and then did his undergraduate work at the University of Arkansas in Fayetteville. He completed medical school at the University of Arkansas for Medical Sciences. His residency was at University of Mississippi Department of Orthopedic Surgery. While in residency, Smith participated in an AO International Fellowship in Switzerland. Smith and his wife, Wendy, have two daughters. His hobbies include cycling, hunting, watching the Razorbacks and skiing. Keep your finger on the pulse of Arkansas’ healthcare industry. To begin receiving Arkansas Medical News in print or on your tablet or smartphone, click on Subscribe in the top navigation menu. Patients over Paperwork CMS recently announced its “Patients over Paperwork” initiative, focusing on reducing administrative burden while improving care coordination, health outcomes, and patients’ ability to make decisions about their own care. According to CMS, physicians say they continue to struggle with excessive regulatory requirements and unnecessary paperwork that steal time away from patient care. Sound familiar? Well, CMS says it is listening to you and is taking action! In the 2019 Physician Fee Schedule, CMS proposed streamlined documentation requirements to focus on patient care and proposed modernizing payment policies so that Medicare beneficiaries can take advantage of the latest technologies to get the quality care they need. For 2019 and beyond, CMS finalized the following documentation changes for Evaluation and Management (E&M) visits that do not require changes in coding or in payment: • The requirement to document the medical necessity of a home visit in lieu of an office visit is eliminated. • For the history and examination for E&M visits for established patients, if relevant information is already contained in the medical record, physicians may choose to focus their documentation on what has changed since the last visit, or on pertinent items that have not changed, and need not re-document the list of required elements if the physician documents that the previous information has been reviewed and has been updated as needed. • For the chief complaint and history for E&M visits for new and established patients, physicians are not required to redocument in the medical record information that has already been entered by ancillary staff or by the patient. The physician may simply document in the medical record that the information has been reviewed and verified. The current CMS documentation requirements differ for each level of care and are based on either the 1995 or 1997 E&M documentation guidelines. Billing Medicare for an E&M visit requires the selection of a CPT code that best represents: • Patient type (new vs. established); • Setting of service (outpatient setting or inpatient setting); and • Level of E&M service performed. Timothy C. Ezell, Currently, there are five levels of E&M visits which may be Partner billed for each of new patients and established patients. A Level 1 visit is the least complex visit, and a Level 5 visit is the most complex visit. Medicare pays a progressively higher amount for each level of visit. As part of the Patients over Paperwork initiative, CMS proposes, beginning January 1, 2021, to pay a single payment rate for Levels 2 through 4 E&M visits, while maintaining a higher payment rate for Level 5 visits. Also proposed are add-on codes for Level 2 through 4 visits that describe additional resources utilized in visits for primary care and certain non-procedure specialized care. CMS has also proposed a new “extended visit” add-on code for Level 2 through 4 visits to account for additional resources required when physicians need to spend additional time with patients. For purposes of documentation, physicians may choose to utilize either the 1995 documentation guidelines, the 1997 documentation guidelines, medical decision-making, or time. If time is used to document the visit, physicians must document the medical necessity of the visit and that the physician personally spent the required amount of time face-to-face with the patient that is required by the CPT code. Documentation required for Level 2 through 4 visits will only require the documentation that is currently required for a Level 2 visit. The estimated payments for 2021 for each level for established patients are as follows: • Level 1 -$24 • Level 2-4 -$90 ($103 for primary care) • Level 5 -$148 The estimated payments for 2021 for each level for new patients are as follows: • Level 1 - $44 • Level 2-4-$130 ($143 for primary care) • Level 5- $211 CMS is also recognizing changes in healthcare practice that incorporate innovation and technology in managing patient care and aims to increase access for Medicare patients to services that are routinely furnished via communication technology. To evidence this commitment, CMS finalized policies to: • Pay clinicians for virtual check-ins involving brief, non-face-to-face assessments utilizing communication technology. • Pay clinicians for remote evaluation of patient-submitted photos or recorded video. • Pay Rural Health Clinics (RHCs) and Federally Qualified Health Centers (FQHCs) for these types of services in addition to the RHC all-inclusive rate and the FQHC prospective payment system rate. Stay tuned as these programs will surely evolve over the next year to make sure you are prepared for all of the changes to come in 2021. 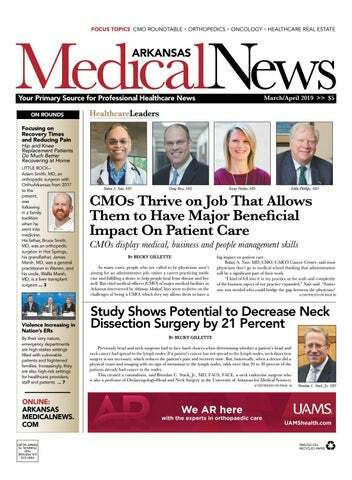 Study Shows Potential to Decrease Neck Dissection Surgery by 21 Percent, continued from page 1 (UAMS) College of Medicine. “Do I operate on everybody to treat 20 to 30 percent of people who need this, knowing that this will result in unnecessary surgery for 70 to 80 percent of the patients?” Stack asks. “If you wait to do the surgery once the patient has recurred with head and neck cancer, the five-year survival rate goes down significantly.” Now there is a better option, thanks to an international study examining the effectiveness of combined PET-CT scans in determining whether a patient’s cancer has spread to their lymph nodes. Stack was co-principal investigator for the study that showed the combined PET-CT scans have the potential to alter neck dissection surgeries in about 21 percent of head and neck cancer patients. The study’s results were published online in the Feb. 15, 2019 issue of the Journal of Clinical Oncology, which is the premier cancer journal not only for the U.S., but the entire world. Stack said the findings are emblematic of personalized medicine at work. “What our study showed, among many things, was how to customize the neck dissection based on the patient’s need,” Stack said. “All the patients in our prospective study had neck dissection, but we found it wasn’t necessary in most and resulted in a change in the surgical plan for 21 percent of patients. Our study showed that when a patient has negative nodes on PET-CT scan, 95 percent of the time the result is truly negative. With a high level of confidence, we can say to a patient that if your neck is negative on PET-CT scans, there is probably no need for a neck dissection.” Stack is hopeful that researchers can take the findings as far as neck nodes and extend that to other types of cancer in other parts of the body. An example would be using the PET-CT scans to predict whether breast cancer has spread to the ancillary nodes. For people with melanoma, the scans could be used to evaluate whether cancer has spread to lymph nodes throughout the body. “Pick the type of cancer, and there is probably a nodal basin this study might apply to,” Stack said. “Ideally, research should provide information that is both usable and capable to being built upon. I’m glad to say that researchers at another institution are already designing a multicenter follow-up trial to ours, which will develop this concept even further.” A PET scan uses a small amount of radioactive material as a tracer to determine the severity of disease. In the case of this study, the tracer used was fluorodeoxyglucose, or FDG, a molecule similar to glucose. CT imaging uses X-ray equipment to produce images of the inside of the body. Stack said when combined, PET-CT gives doctors the ability to see the body’s abnormality in relation to the anatomy, making it a more precise scan. The study has been underway since Stack started the project 18 years ago when he was at Penn State University. He developed the concept with co-principal investigator Val J. Lowe, MD, professor of radiology at the Mayo Clinic in Rochester, Minn. It took nine years to get the National Institute of Health to fund it. The study itself took six years, from August 2010 to December 2016, and was conducted in 25 locations around the world. It required two years of follow up afterward in order to complete the data collection and do the analysis. “This represents a very long-term commitment,” Stack said. Stack said while it was commonly assumed by physicians that a negative scan of the neck meant there was no need for a neck dissection as part of cancer therapy, this assumption had never before been established in a prospective, multi-institution trial. Of the total 286 patients enrolled, 42 were from UAMS. “More patients participated in this study at UAMS than at any other center,” said Stack, “Our first article hypothesizing this concept was published in the journal Cancer in 2001. Now, almost two decades later, we have shown that with the help of PET-CT technology, it may be possible to significantly reduce and/or modify neck dissections performed on head and neck cancer patients.” Cancers that are collectively known as head and neck cancer typically begin in the squamous cells inside the moist surfaces of the head and neck. These cancers can affect the oral cavity, throat, larynx and nasal cavity. The study was initiated by the American College of Radiology Imaging Network, which later joined with the Easter Cooperative Oncology Group, the nation’s premier clinical trial cooperative group funded by the NIH. Results were presented at the American Society of Clinical Oncology annual meeting in Chicago in June 2017, and a two-year patient follow-up concluded in December 2018. The Cancer Clinical Trials and Regulatory Affairs office provided internal support for the study while it was being conducted at UAMS. CARTI is excited to welcome noted breast surgeon Jerri S. Fant, MD, FACS to its staff. After earning her medical degree from the University of Arkansas for Medical Sciences, Dr. Fant completed a fellowship in breast surgical oncology at Baylor University Medical Center in Dallas. She has been in practice for more than 15 years, earning an unmatched reputation as a strong advocate for breast cancer patients and their families. Her passion and dedication make her the perfect fit for CARTI as we continue to meet the growing needs of Arkansas patients. hospital-based obstetrics. Now, the majority of rural counties don’t actually have a place to deliver a baby,” she continued. Coinciding with the decrease in obstetric services has been an increase in precipitous deliveries with more rural babies delivered at home, in ERs, or in the back of an ambulance or in a car en route to a larger facility. On a more positive note, Calmus said, “340B is one of the bright spots in rural healthcare.” In addition to keeping the doors open, she said a number of hospitals are using the 340B money in innovative ways to improve care delivery … and, she stressed, the 340B money isn’t paid for by taxpayers. “The threats to 340B are frequent. We ‘re working constantly to educate legislators and the administration on how well hospitals are using this money,” she admitted. Happily, there are plenty of success stories to share. “Rural hospitals are uniquely positioned to know their patients in a way doctors in urban communities can’t,” she pointed out. Calmus noted one hospital in Kansas kept seeing a family in the emergency room because they had an infestation of bed bugs. Using just a few 340B dollars took care of the problem at a fraction of the cost of an ER visit. Similarly, another patient was having a hard time controlling his diabetes. Tapping into resources to pay his electric bill meant his insulin could be properly refrigerated and therefore more effective. (L-R) Drs. Terry Kowalenko, Vidor Friedman and Leigh Vinocur present survey findings at an ACEP meeting. When it comes to entertainment, education, retail and healthcare, JJonesboro services a trade area that tops nearly half a million people. the construction of the NEA Baptist Healthcare campus, the expansion and new construction of St. Bernards main campus, or the launching of NYIT’s College of Osteopathic Medicine on the campus of Arkansas State University; one would be hard pressed to find a market with more promise. Balan Nair, MD, CMO, CARTI Cancer Center Nair graduated from Grant Medical College, one of the oldest and highly ranked medical schools in Mumbai, India. He was torn between pursuing an engineering versus a medical degree and eventually decided on medicine because he found the science of cell biology quite mesmerizing. He did all his post medical degree training in the U.S. and was drawn to hematology/oncology by Lyle Sensenbrenner, MD, who was his attending physician in Detroit and also an early pioneer in bone marrow transplant. Eddie Phillips, MD, CMO, Baptist Health. Phillips was born in Little Rock, attended Little Rock Public Schools. He graduated from Southern Nazarene University in Bethany, Okla., and then earned his MD from the University of Arkansas for Medical Sciences. He completed a residency in obstetrics and gynecology and started private practice on the campus of Baptist Health in 1980. He became the chief medical officer for Baptist Health in 2013. Patient Care, continued from page 1 keep in touch with how others are thinking,” he said. Ross said he stays engaged with patients by staying visible and in constant contact with patients. “Consistent and purposeful rounding on staff and patients helps me stay connected with the work at the bedside,” he said. “This feedback in invaluable to me as we constantly evaluate our processes of care. Doug Ross, MD, CMO, CHI St. Vincent. Ross was born in Michigan, but moved to Fort Smith in junior high, and calls himself an Arkansan. He married his high school sweetheart, who was born in Arkansas. He went to the University of Arkansas for undergraduate training and studied chemical engineering, went to the University of Arkansas for Medical Sciences, and then did his emergency medicine residency at the University of South Carolina. After residency, he moved to Hot Springs and has been there ever since. MagMutual means more We reward policyholders at every stage of their career with over $215 million returned in the form of dividends and over $15 million paid out to retired policyholders with our Owners Circle® program. Make sure you’re getting more from your insurance company and if you’re not, get more with MagMutual, a leading provider of medical professional liability insurance. MagMutual.com | 800-282-4882 *Dividends and Owners Circle allocations are declared at the discretion of the MagMutual Board of Directors. Even while being mindful the situation might cause patients and family members to act in ways they normally wouldn’t, Vinocur said she believes hospitals are trying to get in front of bad behaviors that could quickly escalate. “Hospitals and health systems realize it’s the safety of their employees and also the safety of their patients,” she said. Of increasing concern, however, are freestanding EDs and urgent care centers. While most hospitals have guards, Vinocur pointed out, “In these ambulatory settings where you are siloed and there’s no security, you are even more vulnerable … and a lot of healthcare is moving to ambulatory settings.” To offset the disturbing trend in violence, Vinocur said there are a number of concrete steps facilities and health systems could take to improve safety. Additional security is one key step whether that is in the form of more guards or more cameras on site. When adding security cameras, it’s beneficial to have the devices visible so that individuals are aware their actions are being recorded. Improved visitor screening is another crucial step. In some areas, particularly large urban areas, metal detectors help screen for weapons. In addition, Vinocur said staff should be trained to ask patients if there is anyone who shouldn’t be allowed in to see them to help curb potential domestic violence interactions. “Training people to deescalate situations, too, is important … teaching hospital staff to recognize the signs of someone who is escalating as they are starting to get more and more agitated,” she said. Vinocur noted clinicians could also play a vital role in easing agitation through clear communication with patients and family members to keep them up to speed. While it’s easy for physicians to get distracted because they are so busy, she said it’s crucial to be aware of how stressful the situation is for patients and their families and why it’s so important to foster engagement. “Tensions run high,” Vinocur concluded. “Open communication can help allay fears and help mitigate out-of-control feelings. It can help ameliorate the very emotional experience of healthcare.” And a calmer emergency department is ultimately a safer one. At NYIT College of Osteopathic Medicine (NYITCOM) at Arkansas State University, we are educating the physicians of tomorrow today. Our medical school not only produces excellent physicians, but also cultivates “servant leaders” who recognize that healthy choices and wellness are vital components needed for the success of the people and communities to which they belong. Outside the classroom, NYITCOM at A-State students are involved in activities that provide mentorship, opportunity, and encouragement to the youth of our state with the goal of creating more educated, engaged, and responsible citizens for Arkansas and our region. At NYIT College of Osteopathic Medicine (NYITCOM) at Arkansas State University, we are educating the physicians of tomorrow today. NYITCOM at Arkansas State University is committed to addressing the primary care physician workforce shortage in Arkansas and the Our medical school not only produces excellent physicians, but also cultivates “servant leaders” who Delta region. By 2030, NYITCOM at A-State will produce more than recognize that healthy choices and wellness are vital components needed for the success of the people 1,000 physicians to serve this state, region, and beyond. and communities to which they belong. Outside the classroom, NYITCOM at A-State students are in activities that provide mentorship, opportunity, and encouragement to the youth of our state Are youinvolved interested in learning more? the goal of creating more educated, engaged, and responsible citizens for Arkansas and our region. Visit uswith at nyit.edu/arkansas 870.972.2786 nyitcom.astate@nyit.edu NYITCOM at Arkansas State University is committed to addressing the primary care physician workforce shortage in Arkansas and the Delta region. By 2030, NYITCOM at A-State will produce more than 1,000 physicians to serve this state, region, and beyond. Medical News provides a definitive list of leaders in the annual InCharge Healthcare issue, which is formatted as a glossy, four-color magazine. And other leaders … including some working behind the scenes … who continue to grow Arkansas’ multi-billion dollar industry.
? ? ? ? ? Coming in April! Want to nominate an Arkansas healthcare leader for a listing? Interested in advertising in the next InCharge? Talk to the publisher: Pamela Haskins 501.247.9189 or pamela@memphismedicalnews.com. GrandRounds Quang Joins ACH, UAMS as Chief of Pediatric Emergency Medicine, Pharmacology & Toxicology LITTLE ROCK – Lawrence (Larry) Quang, MD, has joined Arkansas Children’s Hospital (ACH) and the University of Arkansas for Medical Sciences (UAMS) College of Medicine as chief of Pediatric Emergency Medicine, Pharmacology and Larry Quang, Toxicology. He will also MD serve as professor of Pediatrics and Emergency Medicine in the UAMS College of Medicine. Dr. Quang comes to UAMS and ACH from Oklahoma University College of Medicine, where he served as associate professor of pediatrics. Prior to joining the OU College of Medicine, Dr. Quang held a faculty appointment as assistant professor at Case Western Reserve University School of Medicine in Cleveland, Ohio. He was also the inaugural holder of the $2 million Children’s Medical Research Institute/Express Employment Services Endowed Research Chair in Pediatric Emergency Medicine. In addition to his leadership and clinical responsibilities, Dr. Quang will establish a research lab with Arkansas Children’s Research Institute (ACRI), studying behavioral and molecular effects of antenatal exposure to selective serotonin reuptake inhibitors (SSRIs). Dr. Quang has recently concluded a fiveyear grant for this research from the National Institute of Mental Health, part of the National Institutes of Health (NIH), and will continue this work at ACRI. Dr. Quang completed his medical school training at the 6-year combined accelerated BS/MD Program at Kent State University/Northeast Ohio University College of Medicine and continued on to Children’s Hospital of Michigan/ Wayne State University for his pediatric residency. He then completed his medical toxicology training at Children’s Hospital of Boston/Harvard Medical School. He completed the first two years of pediatric emergency medicine training at Children’s Hospital of Boston and concluded at Children’s Hospital Medical Center of Akron. Dr. Quang maintains board certification in general pediatrics, medical toxicology and pediatric emergency medicine. Mercy Announces Promotions in Operations ROGERS – Mercy Hospital President Eric Pianalto recently announced promotions of two Mercy co-workers. Vanessa Harper was promoted to vice president of operations for Mercy Hospital Northwest Arkansas in Rogers. Harper has more than 25 years of health care experience, including 18 years in human resources. A co-worker at Mercy since 1993, Vanessa Harper Harper most recently served as executive director of strategic initiatives. Her experience includes working with nursing departments, process improvement initiatives, as well as spending time in her early career in Mercy clinics. Harper will oversee hospital operations in environmental services, linen, nutrition services, dieticians and security. Will Tommey has been promoted to director of operations for Mercy Hospital and Mercy Clinic in Northwest Arkansas. With Mercy since 2015, Tommey most recently served as the manager of business surgical services. He earned a master’s degree in acWill Tommey counting from the University of Arkansas and is currently pursuing a master’s degree in health care administration. Tommey is a U.S. Army special forces veteran and has experience working as a revenue accountant. He will provide analytical and operational oversight supporting multiple areas throughout the hospital and clinics. Memphis; University of Sao Paulo Ribeirao Preto, Brazil; Mahidol University, Bangkok, Thailand; and University of Louisville, Kentucky. The team’s findings were made possible by recent advances in gene sequencing technology. The team used an Oxford Nanopore Technologies device called MinION, the only portable real-time device available for DNA and RNA sequencing. Wongsurawat, a postdoctoral fellow who joined UAMS in 2017, said the results show the hand-held device can be used in real-world settings where human biosamples may contain multiple viruses. The team demonstrated the sequencing from a sample containing six viruses: Mayaro virus, Venezuelan equine encephalitis virus, Chikungunya virus, Zika virus, vesicular stomatitis Indiana virus, and Oropouche virus. Wongsurawat said the team overcame challenges of rapid diagnoses of infectious disease epidemics, which are primarily driven by RNA viruses. Sequencing of RNA viruses previously required a number of steps (for reverse transcription of RNA to cDNA) that significantly slowed the process. Using this method, they were able to skip these steps and provide real-time sequencing, which makes rapid detection and characterization of emerging pathogens possible, Wongsurawat said. The team’s work was supported by the Helen Adams & Arkansas Research Alliance Endowed Chair, the National Institute of General Medical Sciences of the National Institutes of Health (NIH) award P20GM125503 and NIH award R01AI103053. Baptist Health Names Brent Beaulieu As System’s Chief Financial Officer LITTLE ROCK – Baptist Health has named Brent Beaulieu as the system’s next senior vice president and chief financial officer. Beaulieu, who has spent 21 years in health care, joined Baptist Health in 2007 as assistant vice president of finance and was promoted to vice Brent Beaulieu president of finance in 2008. He received a degree in accounting from Harding University. Beaulieu has been an asset to Baptist Health in various finance-related positions during his more than 10 years within the system said Troy Wells, president and CEO of Baptist Health. Beaulieu succeeds longtime senior leadership team member Bob Roberts, who formally retired as the system’s chief financial officer on Friday, Jan. 18. Replacing Beaulieu as vice president of finance is Brock Holman, who joined Baptist Health in 2012 as the leader for a newly created Managed Care/Decision Support Department. GrandRounds Rheumatologist Dr. Safwan Sakr Joins the CHI St. Vincent Little Rock Diagnostic Clinic LITTLE ROCK — Dr. Safwan Sakr has joined the team of leading rheumatologists at the CHI St. Vincent Little Rock Diagnostic Clinic. Dr. Sakr is now seeing patients at the CHI St. Vincent Little Rock Diagnostic Clinic at 10001 Lile Drive in LitSafwan Sakr, MD tle Rock. In 2003, Dr. Sakr founded the Baxter Rheumatology Clinic in Mountain Home where he served for the past 15-years. He attended medical school at the University of Damascus Medical School in Damascus, Syria, and completed his residency with the Tesheren Military Academic Hospital in Damascus. He completed his fellowship training in rheumatology at the University of Arkansas for Medical Sciences in Little Rock. Established in 1961, the Little Rock Diagnostic Clinic grew to become a large multi-speciality medical practice providing diagnostic and treatment services to patients throughout Central Arkansas. The physicians, providers and coworkers of the Little Rock Diagnostic Clinic joined CHI St. Vincent Medical Group in September of 2018. Family Practice doctor joins Conway Medical Group CONWAY - Dr. Billy Reid McBay, a family practice doctor, has joined Conway Medical Group, a Conway Regional Primary Care Clinic. Dr. McBay has more than 29 years of experience as a family medicine specialist. He is currently in practice alongside Drs. Laura Massey and Jarrett Lea. Billy Reid A graduate of the McBay, MD University of Central Arkansas, Dr. McBay achieved his medical degree from the University of Arkansas for Medical Sciences in 1990. He completed a three-year residency in Family Practice Medicine at Louisiana State University Medical Center in Shreveport as well as an internship in obstetrics/ gynecology at LSU Medical Center. He moved his practice to Conway in July of 2001. Conway Medical Group is located at 437 Denison St., off of College Ave. For an appointment with Dr. McBay, call (501) 327-1325. Conway Medical Group is one of nine family practice clinics in the Conway Regional Primary Care Network serving Conway, Mayflower, Greenbrier, Vilonia, Clinton, Pottsville and Russellville. The Conway Regional After Hours Clinic is also part of the network. Arkansas Surgical Hospital Names New Chief Financial Officer LITTLE ROCK - Arkansas Surgical Hospital announced that Andrew Covington, CPA, CHFP, has been promoted to Chief Financial Officer. He previously served as the Director of Financial Services for the hospital. As a Certified Andrew Healthcare Financial Covington, Professional, CovingCPA, CHFP ton has acquired a broad range of business and financial skills essential for succeeding in today’s high-value healthcare environment. Covington, a graduate of Harding University, is a member of the American Institute of CPAs and the Healthcare Financial Management Association. the American College of Surgeons, a diplomat of the American Board of Surgery, a member of the Governor’s Breast Cancer Control Advisory Board, and a volunteer for the American Jerry Fant, MD, Cancer Society. FACS Dr. Fant earned her medical degree from the University of Arkansas for Medical Sciences before completing a fellowship in breast surgical oncology at Baylor University Medical Center in Dallas. Lotito has returned Mariaanne to Arkansas after devel- Lotito, MS, CGC oping similar genetic programs in Seattle and the Northwest. She has 20 years experience in genetic counseling, including program implementation of genetic testing for hospitals and oncology practices around the country, as well as direct patient care. Lotito holds a master of science degree in genetic counseling degree from University of Pittsburgh and is board certified by the American Board of Genetic Counseling. She is a member of the professional education committee for the Arkansas Cancer Coalition. GrandRounds Three with Arkansas ties named to board of National Hospice & Palliative Care Organization Little Rock – Two Arkansans have been named to the 2019 Board of Directors for the National Hospice & Palliative Care Organization (NHPCO). Greg Wood, M.S., L.S.W., Executive Director for Hospice of the Ozarks, has been elected and named Chairman of the Board of Directors for NHPCO. Wood has served on the NHPCO Board of Directors for the past five years as a national director and vice-chair for the past two years. There are 28 elected national directors on the board of directors representing large and small, urban and rural, not-for-profit and for-profit hospice and palliative care providers across the country. Even though each provider type is uniquely different, together they can influence and ensure quality care is offered and provided to all Americans at the end of their lives. Wood also serves on the Hospice & Palliative Care Association of Arkansas (HPCAA) Board of Directors. He has been the Executive Director for Hospice of the Ozarks since April 2012 and prior to that he was the CEO for Hospice of North Central Oklahoma for 10 years. Dr. Brian Jones has been named as National Director to the NHPCO board. Dr. Jones serves as the President/CEO of the SHARE Foundation in El Dorado, AR. The SHARE Foundation is a non-profit operating foundation with many programs and agencies, including Life Touch Hospice. Dr. Jones holds a doctorate in Health Sciences from A.T. Still University. He has worked in the field of hospice and palliative care for over 15 years, authoring several peer reviewed journal articles and has spoken around the country on end-of-life care issues. He previously served as Vice-President, Regulatory Chair, and Education Chair for the Kentucky Association of Hospice and Palliative Care, and on the Executive Committee of the National Council of Hospice and Palliative Professionals. Dr. Jones began his career in hospice as a staff chaplain. He also teaches part-time in the public health department at Southern Arkansas University and in the Doctor of Behavioral Health Program at Freed-Hardeman University. He currently serves on the Arkansas Governor’s Council on Aging. A third Arkansas-related appointment to the 2019 NHPCO board is Carla Davis, CEO of Heart of Hospice, which owns hospices in Helena and Fort Smith, Arkansas as well as Louisiana, Oklahoma and Mississippi. Heart of Hospice is based in Charleston, SC. Lisa Vaden, Executive Director of Hospice & Palliative Care Association of Arkansas (HPCAA). All appointments were effective January 1, 2019, and are for a term of three years. Wiegel Earns National OBGYN Board Certification HARRISON - North Arkansas Regional Medical Center (NARMC) is proud to announce that Dr. Micah Wiegel has received his National Board Certification of Obstetrics and Gynecology from the American Board of Obstetrics and Gynecology. This makes Dr. Wiegel the Micah Wiegel, MD only Board-Certified OB-GYN available to patients within NARMC’s five county service area, including Boone, Carroll, Marion, Newton and Searcy counties. According to the American Board of Medical Specialties board certification plays a vital role in making sure physicians critically evaluate their practices, acquire new skills and adapt their practices to changing patient health needs. Board-certified OB-GYNs are also frequently called upon to assist other physicians with patient complications. Dr. Wiegel earned his bachelor’s degree in Biology from Arkansas Tech University and went on to University of Arkansas for Medical Sciences. He joined the NARMC team in 2015. Shortly after starting with NARMC, Dr. Wiegel started his board certification process. In total, the certification is a three-year process that includes both a written and an oral exam. Board certification is a voluntary process and demonstrates a physician’s expertise in a particular specialty. Patients can see Dr. Wiegel before, during and after pregnancy depending on their need. As an OBGYN, he helps women with health issues ranging from birth control, child birth, menopause and everything in between. Dr. Wiegel can screen for cancer, treat infections and specializes in gynecological surgery. Dr. Wiegel was the recipient of the Outstanding MIS Resident Award from the Society of Laproendoscopic Surgeons. Dr. Wiegel practices at NARMC’s Family Medicine Clinic located at 724 North Spring Street in Harrison. To schedule an appointment, call 870-365-0850.
p.m. Smith’s lecture begins at 7:15 p.m. Reservations are required and must be made by March 27 by sending a check to the Historical Research Center, UAMS Library, 4301 W. Markham St., Slot 586, Little Rock, AR 72205-7199. Student tickets cost $15. For more information, contact Timothy G. Nutt, director of the Historical Research Center, at 501-686-6735 or tgnutt@uams.edu. Society members, campus supporters and community guests are welcome. Dress is business casual. The annual dinner and lecture is cosponsored by the UAMS Library’s Historical Research Center. The society provides support for the Historical Research Center in the UAMS Library. It awards an annual research grant to encourage research into the history of the health sciences in Arkansas. Membership is open to anyone with an interest in preserving the history of UAMS and medicine in Arkansas. Stimulation system, was developed by Nevro, a medical device company based in Redwood, Calif. It works by sending electrical pulses to interrupt pain signals and provide pain relief. The system’s implantable pulse generator is placed under the skin of the abdomen or buttocks along with the leads – thin wires that deliver the electrical pulses from the pulse generator to the spinal cord. Study participants will be randomly placed in one of two groups: One providing conventional medical treatments, such as medications and physical therapy; and the other using the spinal cord stimulation device. Eligibility requirements for participating in the study include: •	A diagnosis of painful diabetic neuropathy of the feet and/or legs •	Having tried standard treatments •	Be 22 years of age or older •	Those interested in learning if they are eligible may contact the UAMS Translational Research Institute study coordinator, 501-398-8622. PUBLISHER Pamela Z. Haskins pamela@arkansasmedicalnews.com EDITOR Pepper Jeter editor@arkansasmedicalnews.com ADVERTISING SALES 501.247.9189 pamela@arkansasmedicalnews.com CREATIVE DIRECTOR Susan Graham sgraham@nashvillemedicalnews.com GRAPHIC DESIGNERS Susan Graham, Katy Barrett-Alley CONTRIBUTING WRITERS Timothy Ezell, Becky Gillette, Jerry Halsey, Jr. Lynda Johnson, Cindy Sanders ºAll editorial submissions and press releases should be sent to pamela@memphismedicalnews.com Subscription requests can be mailed to the address below or emailed to pamela@memphismedicalnews.com. Arkansas Medical News is now privately owned by Ziggy Productions, LLC. P O Box 1842 Memphis, TN 38101- 1842 President: Pamela Z. Haskins Vice President: Patrick Rains Reproduction in whole or in part without written permission is prohibited. Arkansas Medical News will assume no responsibility for unsolicited materials. 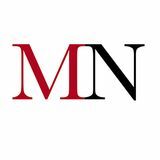 All letters sent to Arkansas Medical News will be considered the newspaper’s property and unconditionally assigned to Arkansas Medical News for publication and copyright purposes. Hereâ&#x20AC;&#x2122;s to 30 years. As a mutual malpractice insurance company, we share a common interest with our policyholders in lowering their risk and protecting their practices. We are proud to say that for the last 30 years, we have helped the physicians and other medical professionals in Arkansas to do just that. Providing protection and support for Arkansas is our natural state. When you need the impossible made possible, we AR here. Advanced care that gets you back on your feet with new treatments and technologies that make patientsâ&#x20AC;&#x2122; lives easier. Thatâ&#x20AC;&#x2122;s what happens when you put world-class researchers and doctors together on the same team. When you are in need, whatever you need, we AR here for you.